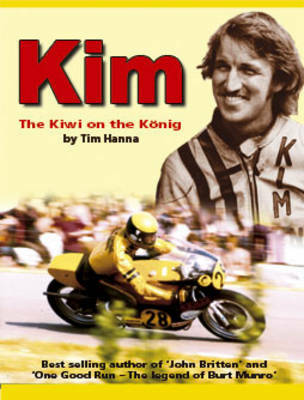 This is the story of the little know Kiwi mechanic - Kim Newcombe - who , in 1973, came second in the 500cc greand prix motorcycle championships. Racing in the 1970s wasn't all about big hair, fags and birds. The high-rolling lifestyle was also a high-stakes game. Bikes were fast... read full description below. This is the story of the little know Kiwi mechanic - Kim Newcombe - who , in 1973, came second in the 500cc greand prix motorcycle championships. Kim Newcombe was a rider who risked it all, reached the top - then lost it all. Killed in a crash at Stowe Corner, Silverstone, 12 August, 1973. New Zealander Newcombe had come to Europe on an overseas adventure, finding a home in West Berlin working as an engineer for Konig, the outboard and hydroplane specialists. Newcombe became the test rider. Newcombe subsequently won the Yugoslavian GP and topped the 500GP table. Then came Silverstone. Newcombe's achievements were singular and remarkable and his story offers an unique insight into the world of grand prix racing in the early seventies. Tim Hanna wrote John Britten and One Good Run - The legend of Burt Munro.